1.1 The race will be governed by the rules as defined in The Racing Rules of Sailing 2017-2020. 2.1 Competitors required to enter with Race Convenor by Friday 17 th February, 15h00. 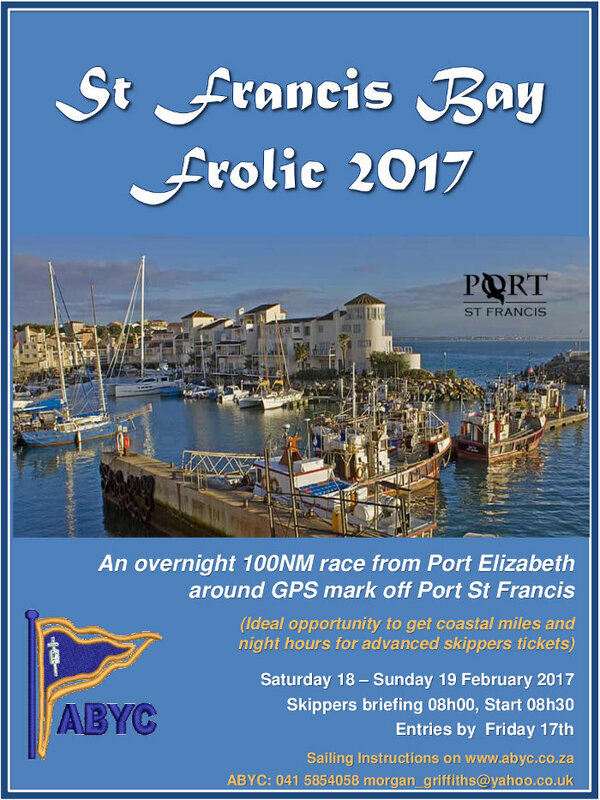 Notices to competitors will be emailed to skippers and posted on the official notice board located at the ABYC Clubhouse. 3.1 Any change to the sailing instructions will be posted before 08h00 on the day it will take effect being Saturday 18 th February, or otherwise conveyed at the Skippers Meeting at 08h00 Saturday 18 th February. 4.2 Familiarization of Charts SAN 1024 and 125 is advisable. All yachts must have suitable working navigational equipment and a GPS, preferably with a Chart Plotter linked to GPS. 4.3 Open to all keelboats with a qualified skipper on board. Skippers holding only a Day Skippers license to liaise with Eugene Lombard or Phil Rademan for vetting; which needs to be confirmed at the Skippers meeting. 5.1 The course is: Harbour Start ? Cape Recife (CAUTION: new wreck site, Baratz, at 34°01’0.14”S 25°43’0.3”E) ? to pass Thunderbolt Reef to starboard ? to GPS turning mark off Port St Francis (34°09’454”S 24°53’18”E. Set in 25m water. This turning mark is where the Flashing (4) 10s buoy marked on SAN 125 used to occur.) ? to pass Thunderbolt Reef to port ? Harbour Entrance (outside) Finish. 6.1 Harbour start: the start line will be between the General Goods terminal and the Ore terminal. The start warning signal will be at 08h25 (dependant on shipping movements – refer to notices). 7.1 Harbour Entrance (Outside) Finish: the finishing line will be the 100m extended transect line of the Port Control Tower to the port entrance light, 100m from the end of the breakwater. In this way shipping movements should not delay finishes. Competing yachts to record their elapsed times (to hours, minutes and seconds); and SMS these times to the Race Convenor. 8.1 Check-Out and Check-In Procedures, sign in and out as pet normal, and additionally you must enter you boat name on the day of sailing with the Race Officer. 8.2 A boat that retires from a race shall notify the Race Officer as soon as possible via cellphone (provided at Skippers Meeting). 8.3 Yachts are strongly advised to carry Life-rafts.